Toss together all ingredients, in a bowl. Rub four 8oz. ramekins with coconut oil. Toss together all ingredients, in a bowl and evenly distribute the mixture to the four ramekins. Top with crisp topping mixture. Bake for 45-60 minutes, until apples are soft and topping is golden brown. Serve with Coconut-Cinnamon Crema (or, if you're indulging a little, serve with this...like we did). 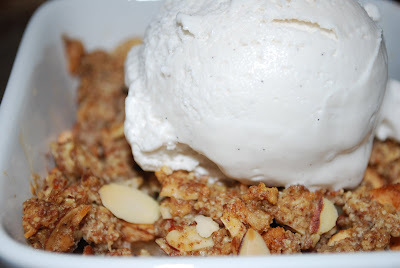 Apple crisp is in the oven baking now and the house smells incredible!!! Took the recipe and made it into 12 mini crisps that way we can have a little treat and not undo our entire day. Thanks for another great recipe!! Thanks for the recipe. Tried it last night with some minor modifications here & there (mostly bc I needed to have me some apple crisp & was lacking some ingredients at home). The end product was delicious! The cayenne pepper was a very good addition. Love the left overs: had some this morning with sheep yogurt for breakfast & 5hrs later, I am still feeling great. Just wanted to say thankyou for a great recipe. I am new to all this gluten free and paleo stuff. I need to change things and it is starting with me and hopefully the family will follow along. I made my first almond butter!! Turned out wonderful, made this lovely recipe and it is delicious!!! Even my 2 year old loved it. She ate 1/4 of it!! I could eat the whole thing!!! Thanks again and I am going to try more of your recipes!! Keep up with the good work!! I look forward to seeing more of what you come up with!! !